There is nothing more satisfying than that last drop of serum, dollop of moisturizer, spritz of a facial mist — said probably no one ever. But to me, nothing can be truer. I’m a huge believer in giving a product a full three months to work its magic before passing judgment on it. (If only I were so kind to myself, but that’s another post entirely.) Fortunately, my skin rarely reacts horribly to a product (the few times it has, I immediately threw it away), so I’m a fairly good beauty guinea pig. 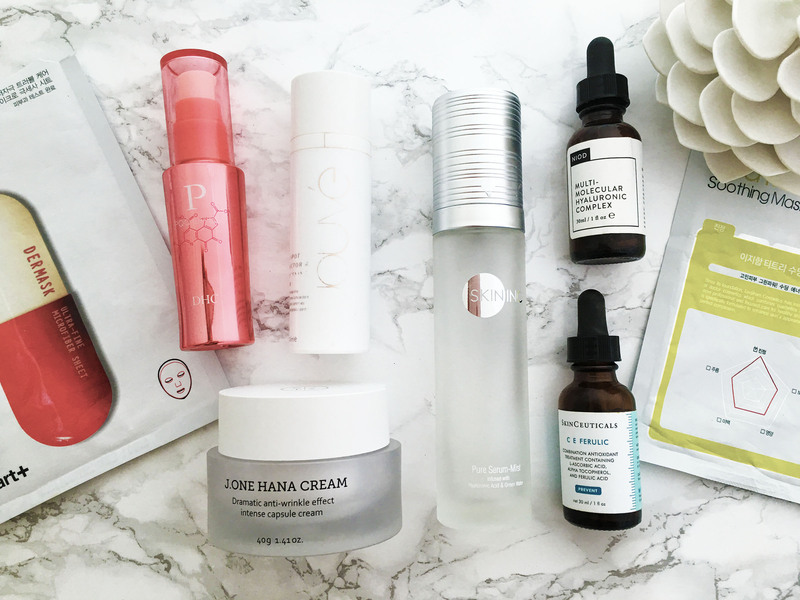 Here, some of my (satisfying) empties from summer 2016 and my thoughts on each. Considering that this is my second bottle that I’ve actually purchased (and at $163, this is an investment), it’s safe to say that this is one of my holy grail skin care products. I’d been reading rave reviews about this vitamin C serum from reputable sources for years, and after learning more about the instability of vitamin C, as well as its effectiveness in anti-aging, as an antioxidant, and in fighting hyperpigmentation, I decided I simply had to take the plunge and buy the serum, despite access to a plethora of press samples. Of course, I always wait for a Dermstore sale. I simply can’t trust the sites on Amazon, especially the ones with highly discounted offers — how old is the bottle? Has it been exposed to light and heat and air? I have to say, I’m pleased with the results. I simply feel that my hyperpigmentation, though not gone, is lighter. My skin is brighter, glowier. 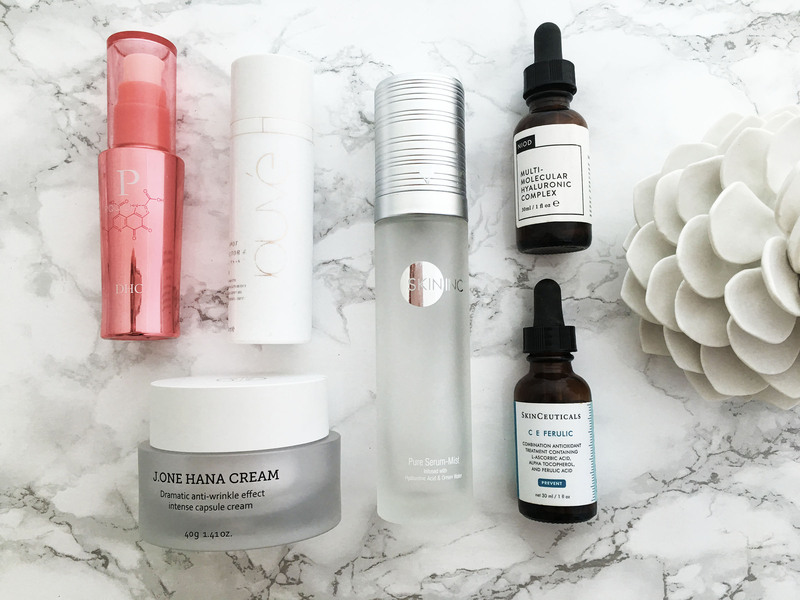 And while this may be the result of a confluence of ingredients that I include in my 12-step skin care routine, I consider this serum a vital part of that routine that has made me feel better about my skin than I have in years. 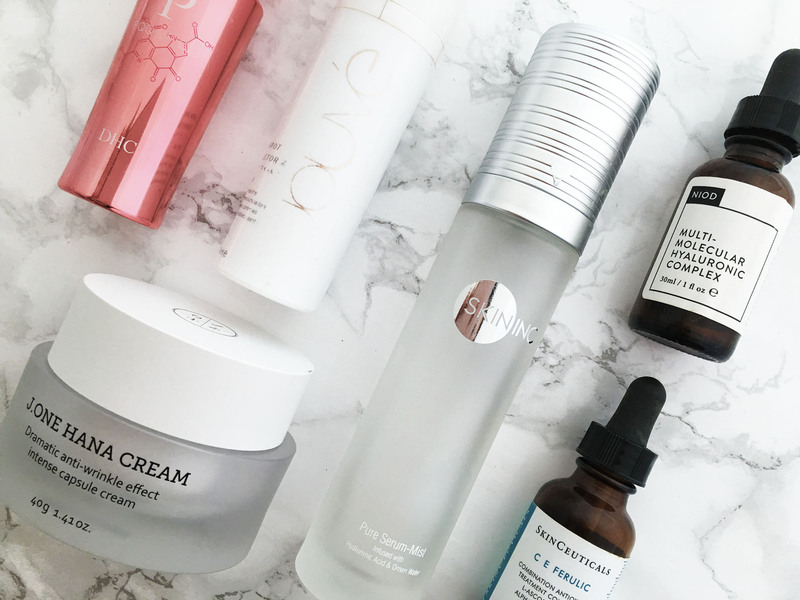 I’m such a huge fan of everything British skin care company Deciem makes, from their Hylamide Sub-Q Anti-Age to this hyaluronic acid serum, which features 12 different molecular weights of hyaluronic acid, for different penetration into the skin and different effects. Ever since I started using their serums, the dryness and tightness under my eyes and along my temples have vanished. I appreciate the detail with which they explain their ingredients and formulations, and seriously, being the shallow person that I am, I’m simply in love with their dropper packaging. Definitely a re-buy. It’s no secret I’m in love with J.One Jelly Pack. Anytime I need to look good, this is what I turn to. Its “skintertainment” cousin, the cream, with its little spheres of moisturizer that you dig out like precious pearls of treasure, on the other hand, is just … fine. Sure, I enjoyed the novelty, and I genuinely liked its fresh scent and squishing the balls between my fingers before applying to my face. And as a moisturizer, it did its job. But I have a low bar for moisturizers. I expect the actives in my serums and essences to change my skin (which is perhaps why I layer so many). But my moisturizers? Just seal in all the goodness I applied before and don’t pill. That’s pretty much all I expect. J.One Hana cream did that. But was it different from any other moisturizers I’ve tried. Not really. And did it impress me like some other moisturizers? No, it didn’t. So will I be re-buying? Sadly, no. And not because it didn’t do its job. But because there are so many out there than can do the same thing. This is a nice facial mist that soothes and hydrates. It has a short ingredient list, which is always good in my book, with mineral-rich onsen water, low molecular weight hyaluronic acid for better penetration, and glycerin. It definitely does what it claims — I used it to spritz my face immediately after cleansing, and it keeps me hydrated for the 10 seconds it takes me to get to one bathroom to my vanity where I apply my Skinceuticals C E Ferulic and acids. It’s not cheap for a facial mist at $55 (though being available at Sephora is a huge plus in my book), and unfortunately it’s in a category that I consider somewhat of a skin care “commodity,” meaning I don’t need that much from this category, so really, any facial mist will do. If I had an unlimited budget, I’d probably re-buy this, since it is a better facial mist than others. While I don’t know that this lightened my spots significantly, this is a great moisturizer in a pump (a hygiene bonus) that does a good job of sealing in all the treatment I applied before. I like that it’s not too slippery or slick like some moisturizers, and I feel that it serves as a great primer for makeup. It’s got oil-soluble vitamin C and radish root ferment filtrate (read: kimchi), and lots of antioxidants, so it’s a solid moisturizer. I’d actually consider re-buying this moisturizer if I had unlimited resources (it’s about $120), but alas. I used this as a sleeping mask, though you can use it as a primer or finisher as well. The gel texture was soothing and perfect for my oily T-zone — I’d apply this all over or just on my T-zone when my cheeks needed more hydration. It’s flush with the antioxidant coenzyme PPQ that promotes natural cell turnover and fights the aging process of glycation. It’s $39, so it’s affordable, but because I have so many other products to try, I probably wouldn’t re-buy this. I don’t need to rave anymore about this mask since I devoted a whole post to it here. Suffice to say: Buy, buy, buy. Desert island must-have. Holy grail. ‘Nuff said. A great backup to the LJH Tea Tree mask. This super-fine microfiber mask (it’s supposedly thinner than a strand of hair!) features the powerful antioxidant glutathione to even out skintone, but I love it for the salicylic acid and tea tree oil for my acne-prone skin. Niacinamide and water magnet sodium hyaluronate are a bonus. While it doesn’t surpass my love for the LJH Tea Tree Mask (which is also almost half the price of the Dr. Jart+ mask), it is a solid mask for blemish-prone skin. One thing I love about toners — they last forever. This one has lasted me a good year, I think, so it makes the $76 price tag less painful. This is another product that I purchased myself, and I like that the brand’s famed Pitera is beefed up with some BHA and AHA for my oily, acne-prone T-zone. I’ll probably at some point buy this again, but I’ve gotta get through my stash of toners first. Thanks for the tip! I can’t wait to try it. That is a very interesting post, I personally have only emptied two products: One is the Benton foam cleanser *but I had already ordered on time…:D * And the second one is a Holy Grail to my skin, it’s a toner mist, that I use right after cleansing and then I add a toner, although this one is a toner but I consider it more a mist that heals, brightens, makes my skin feel so wonderful. This one is over and I will have to order one soon. It is BIFIDA Spray Toner by Rumase. It is one of my greatest discoveries. I was reading the other day about some products by Amore Pacific, especially for the eye area. It’s expensive but it is an investment, and if I can’t afford the whole size, I tend to buy travel samples. but there are also other brands cheaper that do the right job as well. I don’t use 12 products but I learned that each individual is a whole world with their needs that differ one another. I am going to start pretty soon with Aha’s . These days I have started using the Cosrx BHA Aha toner and I love it. Thanks for your explanations. I take note of a couple of them. Let’s see if I can get samples. Hugs and happy week.